Use your existing fleet of vehicles to increase visibility and sales? Sounds easy enough. But not so fast. Make sure you plan carefully so you make your message stick in the minds of drivers all around town. 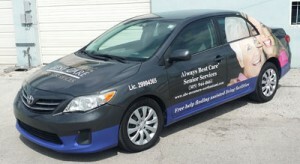 Fleet vehicle wraps work great if done right. Looking for great fleet vehicle wraps in Elgin, Illinois? Then contact us or give us a call at (630) 289-7082. Serving Chicago and the surrounding area. You might think the sides of the vehicle and the back are prime spots. But what about the hood? When the vehicle is parked, people see this. Plus, the large area and shape gives you a chance to vary the graphics a bit. Use hood space as well as the side panels. 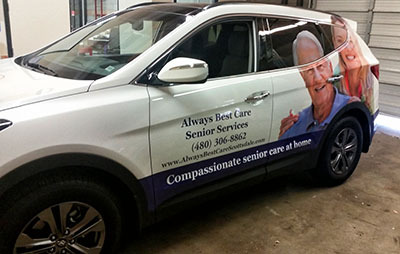 Take a look at this example from Always Best Care Senior Services. Keep your fleet vehicle graphics as simple as possible. Name, phone number, website, and a catchy slogan are all you need. Leave lots of empty space to make it easy to look at. Remember, people are on the move so they don’t have time to read much. Remember, your image must generate interest directly linked to your brand. Plus, if you have a website, all appearances should be in line with how you look online. Make sure the graphics application is done in an environmentally controlled environment. This prevents bubbling and uneven appearance. The industry leader in adhesive wraps is 3M. Their superior quality appears on everything from aircrafts and cruise ships to fleet vehicles. The right laminate offers the advantage of durability and quality images that resist fading due to wind, rain, and sun. For fleet vehicle wraps in Elgin, Illinois contact us or give us a call at (630) 289-7082. We serve the entire Chicago area.